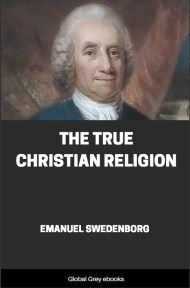 True Christian Religion was the last work published by Swedish visionary Emanuel Swedenborg. In it, he summarizes his theological thought and gives his vision for how the Christian church should function in the coming age. He discusses the spiritual necessity of freedom of choice; repentance, and how it leads to reformation and ultimately spiritual rebirth; the relationship between faith and Christ as redeemer; and sacraments such as baptism and the Holy Supper (Communion). He concludes with a description of the coming "New Church" which will herald a new age of spiritual understanding for humankind. Since the Lord's time the Christian Church has passed through the several stages from infancy to extreme old age. Its infancy was in the lifetime of the apostles, when they preached throughout the world repentance and faith in the Lord God the Savior. That this is what they preached is evident from these words in the Acts of the Apostles: Paul testified, both to the Jews and to the Greeks, repentance toward God and faith in our Lord Jesus Christ (Acts 20:21). It is a noteworthy fact that some months ago the Lord called together His twelve disciples, now angels, and sent them forth throughout the spiritual world, with the command to preach the gospel there anew, since the church that was established by the Lord through them has at this day become so far consummated that scarcely a remnant of it survives; and this has come to pass, because the Divine trinity has been divided into three persons, each one of whom is God and Lord. Because of this a sort of frenzy has invaded not only all theology, but also the church that from the Lord's name is called- Christian. It is called a frenzy because men's minds have been made so demented by it as not to know whether there is one God or three. On the lips there is one God; but in the thought of the mind there are three; consequently the mind and lips, that is, the thought and speech, are at variance; and the result of this variance is that there is no God at all. The naturalism that prevails at this day is from no other source. Consider, if you will, with the lips speaking of one and the mind thinking of three, whether one of these statements does not, when they meet within, cancel the other. Consequently when a man thinks about God, if he thinks at all it is nothing more than thought from the mere name God, unaccompanied by any sense of the meaning of the name that involves any knowledge of God. The idea of God, with all conception of Him, having been thus rent asunder, it is my purpose to treat, in their order, of God the Creator, of the Lord the Redeemer, and of the Holy Spirit the Operator, and lastly of the Divine trinity, to the end that what has been rent asunder may be again made whole; which is done when the reason of man is convinced by the Word and by light therefrom that there is a Divine trinity, and that the trinity is in the Lord God the Savior Jesus Christ, like the soul, the body, and what goes forth from these, in man; and that thus this article in the Athanasian Creed is true: In Christ God and man, or the Divine and the Human, are not two, but are in one person; and as the rational soul and the flesh are one man, so God and man are one Christ. THE UNITY OF GOD. As the acknowledgment of God from a knowledge of God is the very essence and soul of the entire contents of theology, it is necessary that the unity of God should be the first thing treated of. This shall be set forth in order in the following sections: (1) The entire Holy Scripture, and the doctrines therefrom of the churches in the Christian world, teach that God is one. 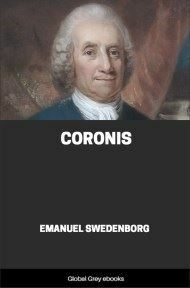 (2) There is a universal influx [from God] into the souls of men of the truth that there is a God, and that He is one. (3) For this reason there is in all the world no nation possessing religion and sound reason that does not acknowledge a God, and that God is one. (4) Respecting what the one God is, nations and peoples have differed and still differ, from many causes. (5) Human reason can, if it will, perceive and be convinced, from many things in the world, that there is a God, and that He is one. (6) If God were not one, the universe could not have been created and preserved. 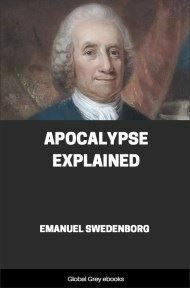 (7) Whoever does not acknowledge a God is excommunicated from the church and condemned. 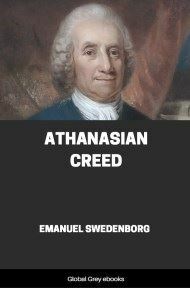 (8) With the man who acknowledges several Gods instead of one, there is no coherence in the things relating to the church. These propositions shall be unfolded one by one. (1) The entire Holy Scripture, and all the doctrines therefrom of the churches in the Christian world, teach that there is a God and that He is one. The entire Holy Scripture teaches that there is a God, because in its inmosts it is nothing but God, that is, it is nothing but the Divine that goes forth from God; for it was dictated by God; and from God nothing can go forth except what is God and is called Divine. This the Holy Scripture is in its inmosts. But in its derivatives, which are below and from these inmosts, the Holy Scripture is adapted to the perception of angels and men. The Divine is likewise in these derivatives, but in another form, in which it is called the celestial, spiritual, and natural Divine. These are simply the draperies of God; for God Himself, such as He is in the inmosts of the Word, cannot be seen by any creature. For He said to Moses, when Moses prayed that he might see the glory of Jehovah, that no one can see God and live. This is equally true of the inmosts of the Word, where God is in His very Being and Essence. Nevertheless, the Divine, which forms the inmost and is draped by things adapted to the perceptions of angels and men, beams forth like light through crystalline forms, although variously in accordance with the state of mind that man has formed for himself; either from God or from himself. Before everyone who has formed the state of his mind from God the Holy Scripture stands like a mirror wherein he sees God; but everyone in his own way. This mirror is made up of those truths that man learns from the Word, and that he appropriates by living in accordance with them. From all this it is evident, in the first place, that the Holy Scripture is the fullness of God. That the Holy Scripture teaches not only that there is a God, but also that God is one, can be seen from the truths which, as before stated, compose that mirror, in that they form a coherent whole and make it impossible for man to think of God except as one. In consequence of this, every person whose reason is imbued with any sanctity from the Word knows, as if from himself, that God is one, and feels it to be a sort of insanity to say that there are more. The angels are unable to open their lips to utter the word "gods," for the heavenly aura in which they live resists it.